The 1992 GT shared the same outside looks at the 1991 Mustang GT with its solid grille with center ford emblem; 16 inch 5 spoke cast aluminum wheels; and aerodynamic front, side and rear skirt panels. Under the hood, the 1992 Mustang GT received the 205hp, 5.0L, High Output, V8 engine. 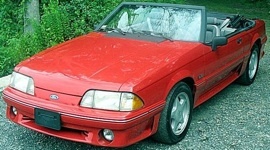 The 1992 Mustang convertible GT was the first Mustang with a base model price over $20,000. Oxford White 1992 Mustang GT hatchback owned by Brett and Rene Adams from Ozark, Missouri. It has the 5.0L V8 engine and an automatic transmission. Brett shares, "This 92 Ford Mustang GT came to our stable after spending a little time being abused as it was in the hands of a 17 year old student. That was five years ago. Since then, the ol' girl has received quite a few upgrades both internally and externally. Inside, the 92 has virtually remained stock, with the exception of an aftermarket stereo system. Under the hood is a Cold Air Kit with aftermarket Short Tube Headers that exit through Flowmaster 40 Series Mufflers. As for the body, the 92 has changed shoes to 5-Lug Chrome 2003 Cobras, a 4-inch Cowl Hood and LX Style Tail Lights. Our Love for Fox Bodies has grown so much that three years ago we started a foundation called 'Save A Fox Foundation' on Facebook. We currently have over 1600 members." Ultra Blue over Titanium 1992 Steeda Supercharged Mustang GT hatchback with Steeda grille emblem, Steeda graphics, five spoke wheels, tinted glass, roll bar cage, sport seats, engine and instrument upgrades. This is an Ultra Blue 1992 Mustang 5.0L GT hatchback at the 2011 Mustang Roundup car show held in Bellevue, Washington. Its a little overcast, but in the sun, this color glows!